From time to time, we visit the Southern Isles off the west coast of Scotland. The southern part of the Western Isles are Catholic from Barra north to Benbecula. More or less undisturbed by the Reformation, there are shrines to the Virgin Mary at the edge of the road. 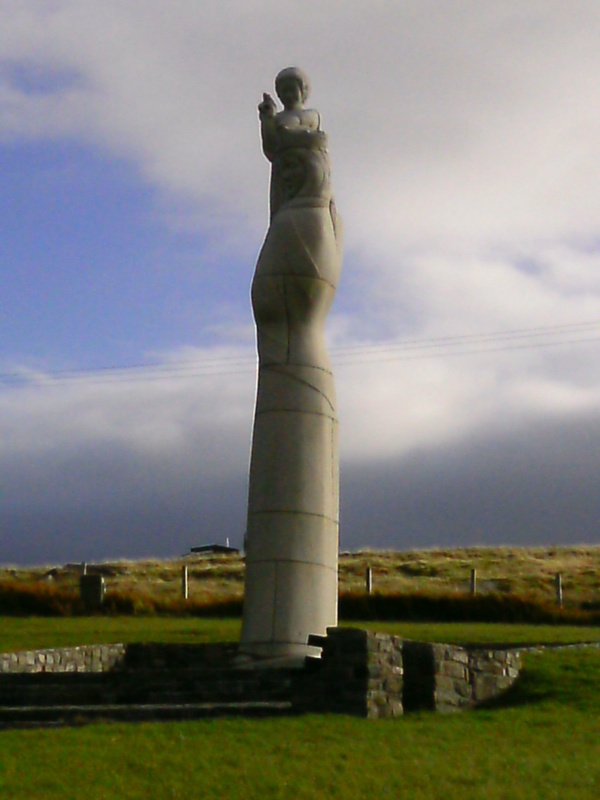 On a hillside in South Uist, stands a 25 foot tall statue of the Virgin Mary holding the infant Jesus in her arms as she looks down over the north part of the island and out towards the sea. It is known as Our Lady of the Isles or in Gaelic, Bana Thighearna nan Eilean. The statue was built in the nineteen fifties, at a time when a huge military establishment was proposed on the island which would have resulted in the displacement of the native people and their way of life. In the end, a scaled down version of the military range was built and no-one was displaced, although the hillside where Our Lady of the Isles stands is topped by radar domes, making it a strange juxtaposition of mother and child and military might. The last time I visited this statue, I had already made the decision to become Catholic. 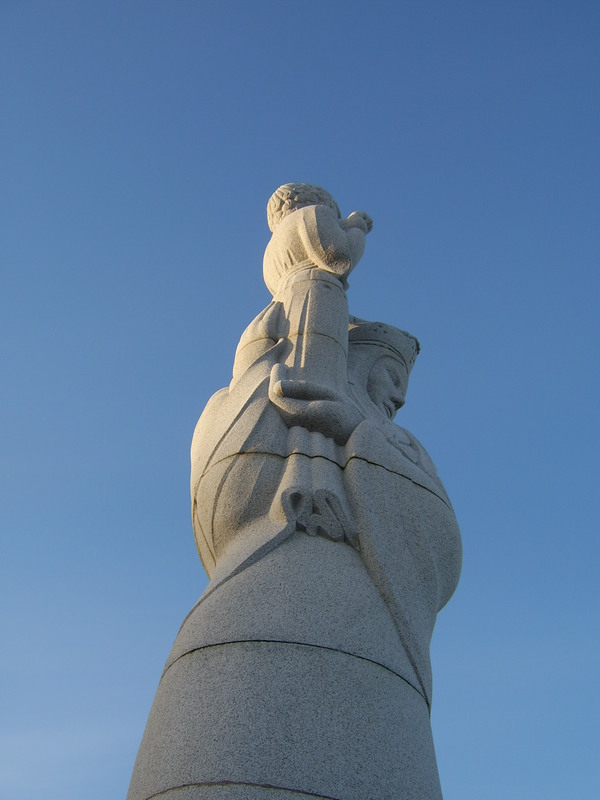 I watched my children playing at the foot of the statue, looked out over the lochs and crofts of South Uist, and wondered how devotion to Mary, the mother of Jesus, was going to work out in my life. This is something which comes instinctively to Catholics, but which is a great challenge to Protestants. As we clambered back into the car, and drove northwards, over the causeway to the island of Benbecula, I felt a deep, settled sense of peace, the kind of feeling which you can’t explain or manufacture for yourself. It comes as a gift. That was the only time I have ever really experienced a felt connection to Mary the mother of Christ. It is one of these things which doesn’t come naturally, but until it does, I’ll just keep on trusting the church’s teaching in this regard. That isn’t quite the end of the story. A few days later, I was walking past a statue of a lady, and experienced an instantaneous feeling of peace as I thought to myself that it was nice to see another statue of the Virgin Mary. It took a few seconds for my mind to catch up and realise that I had returned to a mainly Protestant town, and that I was looking at an image of a rich lady who had lived in the nineteenth century. By the standards of her time, she was considered a good person, but from a modern point of view she was someone who lived a priviledged lifestyle whilst others around her lived in poverty. As a reformed Protestant, I was brought up to regard religious statues as idolatrous, but I asked myself what’s worse: erecting a statue of Mary and baby Jesus or putting up a statue to glorify a politician, a landlord, a member of the royal family or a military dignitary? If we take the view that religious statues are idolatrous, then we should be consistent and ban any statues which glorify influential people, whether they are dead or alive. If we look at it another way and say that putting up a statue of a notable person is not idolatrous, but a way of honouring them and reminding us of their life or their achievements, then isn’t that exactly what a religious statue does?It’s not put there, so that we can worship a slab of stone, but as a reminder of a person’s life and how God used them. Given a choice between an image of Mary, the mother of Jesus, and a statue of a rich nineteenth century lady, I would choose a statue of Our Lady any day.